This type of network protocol allows for the secure transmission of data and encrypts data that is exchanged between a website and its visitors. Unauthorized users are unable to access this data which is especially important when querying sensitive user data such as passwords, email addresses or bank account information. Sites that don’t use HTTPS instead of HTTP judiciously are crippling the privacy controls you thought were protecting your data. Websites’ adoption of opt-in sharing and straightforward privacy settings are laudable. Those measures restrict the amount of information about you that leaks from websites (at least they’re supposed to). Yet they have no bearing on sniffing attacks if the site doesn’t encrypt traffic. This is why sites like Facebook and Twitter recently made HTTPS always available to users who care to turn it on — it’s off by default. Note: Your web host may also do all these steps for you too – check with them before proceeding. This can get complicated and if you can wait 1-2 days it may be best to let them do it. But Unless you’re installing up the certificate yourself, this is the easiest step you’ll ever do. All you have to do is sent a message to your host requesting that they change your website from HTTP to HTTPS. 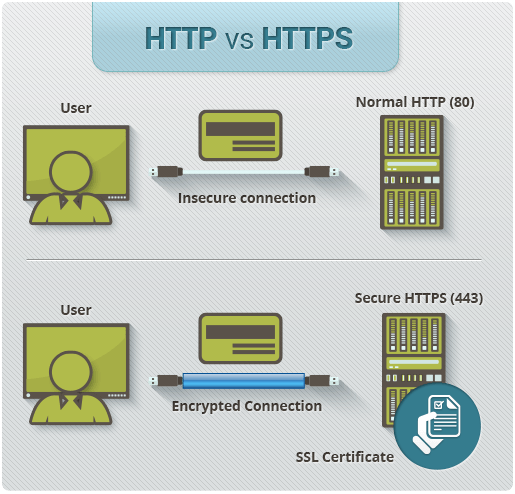 Are you convinced to add https to your small business website? Have you already made the switch? If so, what benefits have you experienced? We’d love to hear your comments so please do share your experiences with us.